OK, so at Christmas it feels a little like all hell breaks loose. But days go on as usual and with just a little willpower you can retain some kind of structure so that January 2nd doesn’t feel like a cruel blow. By that we mean have a proper (yet indulgent) breakfast on Christmas Day like eggs and soldiers or delicious Greek yoghurt and blueberries. Have you been waiting for someone to tell you it’s healthy to eat as much cheese as you like? Well now’s the time – at least for your teeth anyway! Cheese is high in calcium, which keeps enamel and bones strong, making it the perfect alternative to a Christmas pudding or mince pie which is loaded with dried fruit and sugar. It’s also great at neutralising acids and cleaning your teeth, so a simple trick is to snack on a slice after the odd indulgence. We don’t just mean nasty old Scrooges, we mean the sweets too. Hard-boiled, sugary sweets and tough toffee pennies are top causes behind some of the biggest casualties we see in the new year. If you really can’t stay away from the sweetie tin, opt for sugar-free boiled sweets, runny caramels and plain old chocolate. And we don’t just mean the ornamental kind. Walnuts, chestnuts, brazil nuts and more are staples of Christmas, but to ensure you don’t chip a tooth, always use the right tools. While you’re at it, a bottle opener is a far more sturdy alternative than your gnashers! Fizzy alcoholic drinks can be a double whammy of sugar and acid on your teeth, so red wine would be a slightly better choice, but pair it with a glass of water to diffuse some of the staining and acidic effects. Milk-based cocktails, mocktails and warming drinks are also another excellent choice. Don’t be your own worst Grinch – allow yourself a treat. It’s Christmas after all! But make sure you still keep some boundaries, otherwise it’ll be Easter and the scales (and your teeth) won’t have known what’s hit them! 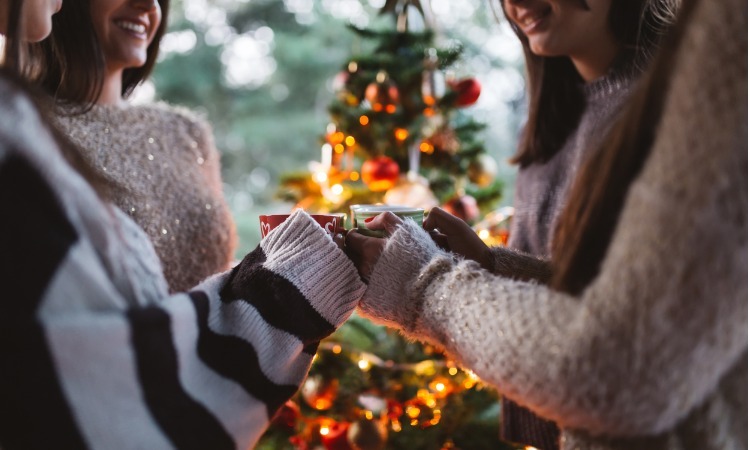 At Christmas we mostly know in advance what plans we have coming up, so if you know you’re going to a three-course meal, saving your indulgence for the evening will make it easier and more logical to resist temptations through the day. With that in mind, you should be set to have a great time however you’re celebrating this season. From all at Number 18 Dental – we wish you a Merry Christmas and a Happy New Year!